I was banned from pay-not my or anyone else’s-pal years ago when I LEGALLY sold a commerative rifle through AuctionArms. Having a pay-not my or anyone else’s-pal account, I let the buyer pay through pay-not my or anyone else’s-pal .You’d think I was lee harvey oswald reincarnated! After numerous back and forths I wrote them a “strong letter” (calling them everything explative known to man plus a couple more is so tacky!) and told them if they could get it past their head what they could do to themselves. I stopped using these bolsheviks over 10 years ago and have never looked back. I’d say it was a scam to get your banking details. A variation on the regular Nigerian scams. Report it- but to whom? No, its more likely to be Paypal’s response to anti-money laundering or anti-terrorism laws, in AU any transaction over 10k (or any ‘suspicious’ transaction) must be reported to the relevant authorities, which means that you have to be verified. Which would make sense if I was spending $10K all at once. But this is $10K over a dozen years! Even in the surreal world that is modern America that can’t be confused with money laundering. @Vulture, I do take your point, however after seeing numerous stories similar to yours over the years, I believe they’ve interpreted the relevant legisltation (worldwide) and have taken the “lowest common denominator” approach, that is, whenever your transactions amount to > $10k, then according to their (self made) rules, you must identify yourself. 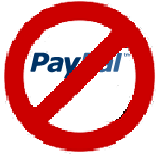 I stopped using paypal about 4 years ago, and only recently have stopped getting emails from them. it is probably because you have had a recent change in your credit card or bank arrangements in the paypal account settings. For example, I changed banks from one bank to another, removed the old bank from paypal preferences, added the new bank to paypal preferences, and then before verifying (look at the new bank account, enter the 2 transactions in the paypal form) i bought something new on ebay. Then I get the notice. It isnt that I have spent 10,000 as the email says, it is that I dont have ANY verified accounts left. The paypal message is for people who have no verified account OR have spent 10,000 and need to re-verify. The reverification is probably there to keep somebody from stealing more than 10,000 of your dollars.